Find the Best Lipoic Acid Supplement at the Right Price - Alpha-Lipoic Supplements Found to Range 1,000% in Cost! Lutein, Zeaxanthin and Vision Formulas Vary Widely - Which Vision Supplement Is Right for You? Find the Best Tuna and Salmon and Avoid Mercury - Find the Best Tuna and Salmon. Labels Won't Tell, But We Will. Know When to Take Vitamin A and Which Products Are Best - Be Careful with Vitamin A Supplement Dosage! Joint Health Supplements for Dogs and Cats - Choose Joint Supplements for Pets Carefully! Few Red Yeast Rice Supplements Provide Effective Dose - Some Red Yeast Rice 15X Stronger Than Others! See CL's Top Pick for Ashwagandha and Learn What It Does - See the Test Results for Ashwagandha! Berberine and Goldenseal - Avoid Fakes! - Berberine and Goldenseal - Do They Work? Best Brand? L-Arginine - Does it Work? Best Brand? - L-Arginine - Does it Work? Best Brand? Does Your Vitamin K Supplement Contain What It Claims? - Find the Best Vitamin K Supplement for You, Now! Half of Kelp Supplements May Not Be Safe - Caution with Kelp Supplements! 50% of Aloe Products Fail Testing - Choose Aloe Pills, Gels, and Drinks Carefully! What We Found With Nattokinase Supplements May Suprise You - Nattokinase: Does It Work and Which Supplements Are Best? Lysine Supplements for People and Pets Tested and Compared - Does Lysine Work for Cold Sores? Which Product Are Best? DHEA Supplements -- Do They Reverse Signs of Aging? - Use and Choose DHEA Supplements Carefully! See Our Picks for Protein, Energy, Fiber & Whole Food Bars - How Does Your Nutrition Bar Stack Up? Lactose Intolerance Products Found to Vary in Strength and Cost - Can Lactose-Free Milk and Supplements Help with Intolerance? They're Popular in the Gym, But Can Nitric Oxide Supplements Help You? - Do Nitric Oxide Supplements Work? Over 400 brands tested. Choose one below or see a complete list. The Academy of Nutrition and Dietetics recognized ConsumerLab.com as an independent organization that evaluates supplement quality in its recent position paper on micronutrient supplementation. The AND is the world's largest organization of food and nutrition professionals. In Reader's Digest's "8 Nutrients You Shouldn't Take in Pill Form," Dr. Tod Cooperman of CL explains which supplements are best taken as a liquid. "Do Gummy Vitamins Work? Here's What Experts Say" in TIME magazine (March 13, 2019) cites ConsumerLab's finding that gummies were the most likely type of multivitamin to fail its tests of quality. In "The CBD Oil Boom" on the Dr. Oz Show, Dr. Sanjay Gupta, Dr. Oz, and Dr. Tod Cooperman discuss CL's tests of CBD and hemp supplements. "Supplements for Brain Health?" on AARP.org features information from ConsumerLab's reviews of B vitamins, curcumin (from turmeric), cocoa flavanols and fish oil. "Not All Bone Broths Are Healthy" in BottomLine Personal cites findings from ConsumerLab's Bone Broth Review. "Don't Trust the Label on Your Supplements" in Outside magazine features an interview with ConsumerLab.com's scientific staff and explains the role that 3rd party testing organizations play in helping consumers find better quality supplements. The Dr. Oz Show segment "Is Your Apple Cider Vinegar Real?" 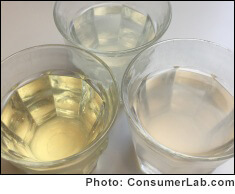 featured ConsumerLab.com's recent tests of popular apple cider vinegar bottled liquids and pills. "Vitamin and Mineral Supplements – What Clinicians Need to Know" in JAMA provides general guidance for supplementation and notes that, because the FDA is not authorized to review dietary supplements for safety and efficacy prior to marketing, clinicians may wish to advise patients to consider selecting a supplement that has been certified by independent testers, such as ConsumerLab.com. "Should You Drink Matcha Tea?" in TIME magazine provides an overview of matcha green tea and discusses ConsumerLab.com's test findings for popular brands of matcha. "What Are Greens Powders – and Do You Need Them?" in U.S. News cites ConsumerLab.com's findings of lead and arsenic in some greens powders. In "How Can You Choose a Good Supplement," on The People's Pharmacy, Terry Graedon recommends ConsumerLab as a good resource, adding that its information "... can be crucial for finding a good supplement." On Food Sleuth Radio from PRX, host Melinda Hemmelgarn, M.S., R.D. interviewed ConsumerLab.com's president, noting, "I cannot promote ConsumerLab enough... I believe it is the #1 source for dieticians and physicians for sorting truth from fiction and finding out which supplements include their ingredients and perform as manufacturers claim." "Your chances of choosing a cocoa product with lots of flavanols" on NutritionAction.com discusses ConsumerLab's recent findings with cocoa powders and dark chocolates. "Lab Tests Find Insect Parts, Larvae in Dried Turmeric Spices" on ABC News featured results from ConsumerLab.com's tests of turmeric spices and curcumin supplements. "Is There Cadmium in Your Cocoa?" on BerkeleyWellness.com cites ConsumerLab.com's findings of cadmium and lead contamination in popular cocoa powders. An article in the Journal of Consumer Health on the Internet calls ConsumerLab.com "current, thorough, unbiased, and rigorous," concluding that "ConsumerLab.com fills a vital gap in our current consumer protection infrastructure." The article "No Evidence of Aloe Vera Found in the Aloe Vera at Wal-Mart, CVS" on Bloomberg cites findings from ConsumerLab.com's Aloe Review and tests by Bloomberg. An article from Consumer Reports about "Supplement Seals" shows that ConsumerLab.com is the only certifying organization that purchases its initial test samples in stores, while others obtain samples from the manufacturer. In "Here's What's Really In Your Multivitamin" on Reuters Health Watch, ConsumerLab.com's President, Tod Cooperman, M.D. discusses issues with multivitamins and their use. The Wall Street Journal article "Does Matcha Beat Green Tea in Health Benefits?" refers to ConsumerLab.com's report on green teas and quotes ConsumerLab.com's president, as saying "You'll get about two to three times more EGCG from matcha" than from regular green tea. ConsumerLab.com president, Tod Cooperman, M.D., recently spoke at the U.S. National Institutes of Health (NIH) as part of the "Meet the Watchdogs" panel of the 2016 Dietary Supplement Research Practicum. A Frontline report about supplements and safety suggests consumers ask "Has the product been tested by independent labs" and lists ConsumerLab.com as a resource. The New York Times article "Vitamin Expiration Dates" features ConsumerLab.com president Tod Cooperman, M.D. 's advice about "best by" dates on labels and other tips for storing and using supplements. The Journal of the Academy of Nutrition and Dietetics article "Quality Certification Programs for Dietary Supplements" compares ConsumerLab.com to other certification programs in the U.S. CL is the oldest program and the only to freely publish its methods. Find out the right amount of a vitamin or mineral to get each day.